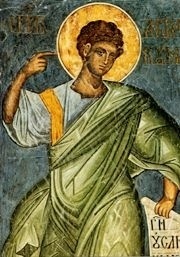 Celebrating the memory of Thy Prophet Habbakuk, O Lord, through him we beseech Thee: Save Thou our souls! O divinely eloquent Habbakuk who announced to the world God’s coming forth from the south, from the Virgin, and who, standing on divine watch, didst receive a report from the radiant angel: thou hast proclaimed the resurrection of Christ to the world. Wherefore, in gladness we cry out to thee: Rejoice, O splendid adornment of the prophets! ➢ It is time for “Toys for Tots.” See Stavroula if you have any questions! ➢ Our Nativity drive for Jackson Fuel is going on. Please state clearly on the check or envelope if you want to contribute! Please be aware that children downstairs need to be monitored and cleaned up after. St. Nicholas celebration will be on the Eve of St. Nicholas (Dec 5th), following an earlier Vespers (which will be held at 5.00 pm.) Bring a desert to share! The Nativity Fast is going on. For your own spiritual benefit, and for the glory of God, please observe it to the best of your ability!